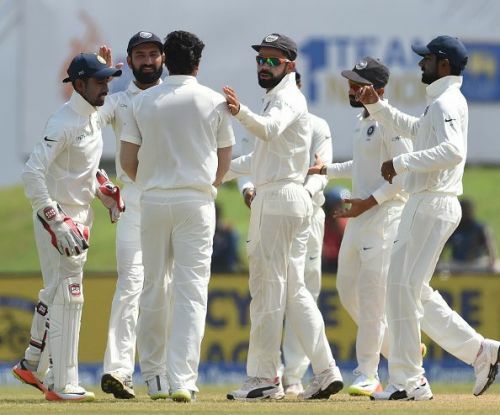 Sri Lanka slid to 154/5 (read 6 courtesy Asela Gunaratne's injury) as India tightened their grip on day 2 of the first Test at the Galle. Resuming on their overnight score, India lost four wickets for 104 runs before lunch with Cheteshwar Pujara dismissed by a relentless Nuwan Pradeep for 153. Hardik Pandya and Mohammad Shami provided some fireworks with the former smashing a half-century on debut as India finished on 600. Upul Tharanga seemed to have taken a liking to Dhawan's approach on day 1 and started the innings with some punchy strokes even as his partner, Dimuth Karunaratne, made a mess of a review to walk back to the pavilion. Debutant Gunathilaka hung around for some time as Tharanga dug into an otherwise incisive Umesh Yadav. Shami broke the back of Lanka's counter-attack though, with two wickets in an over. Angelo Mathews joined Tharanga and the duo put on a more mature stand as India operated with their spinners. Tharanga raced to his fastest half-century in Tests, off 44 balls, before a moment of madness saw him run himself out. Ashwin grabbed the vital wicket of Niroshan Dickwella late in the day courtesy a fabulous catch by Abhinav Mukund to have Lanka on the mat at stumps. Here are the talking points from the day's play at Galle. Pradeep was Sri Lanka's only bowler to exert some sort of pressure on the Indian batsmen on day 1. 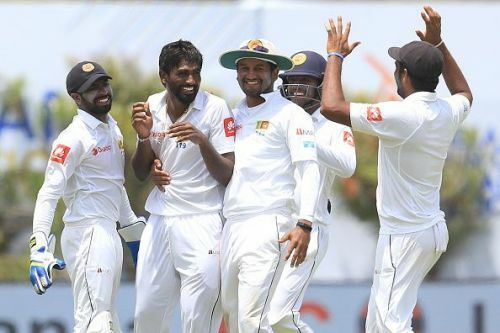 Even as Lahiru Kumara and Dilruwan Perera sprayed the ball about, Pradeep kept attacking the fourth stump line, causing trouble to the Indian batsmen, including the sturdy Pujara. He started day 2 with a bang after getting all three wickets to fall on day 1. The consistent lines and seam movement accounted for Pujara, who rarely pushes at anything without uncertainty. The pressure exerted by Pradeep was evident in Pujara's push which resulted in an outside edge that was snapped up by Niroshan Dickwella. Pradeep had taken 4 out of the first 4 wickets to fall. He went on to add the wicket of Ashwin to complete his first 5-wicket haul in Test cricket and made it 6 with a thumping yorker to Jadeja after the lunch break.